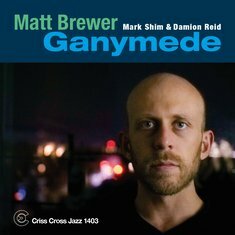 Matt Brewer's third Criss Cross leader album, Ganymede, follows a pair of inspired ensemble recordings (Mythology. Criss 1373; Unspoken, Criss 1390), for which the master bassist convened some of the most accomplished individualists of 21st century jazz to interpret original music that showcased Brewer's sophisticated compositional skills, lyric gifts, and state of the art chops. Here, Brewer pares down to the trio format, allowing tenor saxophone hero Mark Shim, drum virtuoso Damion Reid and himself ample room to stretch out on challenging "inside" repertoire by Ron Carter (" R.J. ") and Joe Henderson (" Afro-Centric "), "outside" songs by Ornette Coleman (" Eos "), and Dewey Redman (" Willisee "), a complementary piece by Shim, and four of his own well-wrought originals.